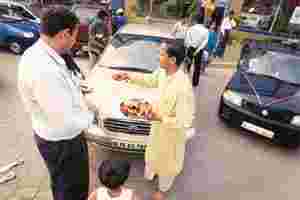 Enticing offers: Buyers outside a car showroom in New Delhi. Television advertisements have the greatest impact on car buying decisions, a new study has found. The shopping experience at dealer outlets and test drives also matter, but it is what they see on TV that drives customers to buy a particular car. The 2007 Syndicated Market Contact Audit study conducted by TNS Automotive, a market research firm, says that television, followed by print, is still the most effective advertising medium to reach target consumers in India. The auto sector has been the second biggest advertiser in the country for the past three years, in terms of value. Ad spends by auto companies added up to Rs655 crore last year or about 4% of the entire advertising spend, according to MindShare, a media buying agency. Increased spends have resulted in clutter, making it hard for companies to figure out which medium works best for them. “With the explosion of media, it is becoming increasingly difficult for a marketer to know which media is working for the brand and which is not," said Pradeep Saxena, senior vice-president, TNS India Automotive. “And this is not just about conventional media such as television, press and outdoor; there is a huge spending on road shows, events sponsorship and even test rides," he added. Marketing spend is a function of the stage of its lifecycle a brand is in, according to Ankush Arora, vice-president, sales and marketing at General Motors India Ltd. which recently introduced a small car, Chevrolet Spark. “If it’s new, the spend is higher on mass communication, to make people aware. As it gets estabilised, we concentrate on point of sales. (But generally) the investment in mass communication is higher," he said. Websites and brand ambassadors work as effective marketing mechanisms in the metros, says the study, while customers in smaller cities respond well to sponsorship of television programmes and events. The least effective are community initiatives such as education on road safety, sponsorship of motor racing events, and ads on radio. The study surveyed close to 2,000 car owners and potential buyers across 10 cities. Ravi Krishnan contributed to this story.